Feel free to send us comments and corrections for this page, you should not necessarily believe everything you read on the internet! The low noise block (LNB) is what takes the infinitesimally small signal collected from a parabolic SatComm dish, amplifies it and mixes it down. It sits in front of the dish in a weatherproof housing. The example everyone is familiar with is the LNB that sits in front of your satellite TV antenna, there are 100s of millions installed around the world. We speak from experience here, having designed an LNB prototype in 1996 for the Korean market (don't ask how many were sold...) Before you decide that you want to compete in manufacturing LNBs, think about this: unless your employees are content to share a single pair of shoes, forget about it. You will never compete in price! The front end of any direct broadcast satellite (DBS) receiver is the low noise block. The LNB is an environmentally packaged (read that: rain and sun proof) superheterodyne receiver. A two or three stage low noise amplifier sets the noise figure to just under one dB with maybe 20 dB of gain, then a mixer downconverts to an IF frequency. An IF amp boosts the overall gain to 55 to 60 dB. The picture below show the guts of a LNB, after you run over the plastic housing with your car, peel of the metal lid and unscrew the mode-suppression sub-cover. Absent from the field of view is the downconverter integrated circuit, which is actually on the back of this double-sided board. Somewhere are a voltage regulator and a DC-DC converter for generating the negative voltage that is needed for the pHEMT amplifier stages. The DC supply to the LNB is fed right up the coax cable and picked off with a bias tee. Covering North American and European applications, the down-converter needs to cover 950-2150 MHz IF. The unit needs to perform well from -40 to +85C. Signals are circularly polarized for the Dish Network and for Direct TV. Therefore you don't have to worry about skew when you line up the dish; other systems may have separate H-pol and V-pol signals so the LNB mounting scheme might include a means of rotating it to fine-tune the alignment. Having separate vertical and horizontal amplifier chains in the example LNB makes it possible to pick up both LHCP and RHCP, which doubles the amount of data that is possible in the link. Switching is done at IF frequency to minimize noise figure degradation. DC power to the LNB is typically 18 volts at up to 500 mA. A DC-DC converter produces a lower positive voltage and a negative voltage if required. A linear regulator may be used to clean up the DC supplies for the LNA and down-converter functions. A dielectric resonator oscillator (DRO) is used to create the LO signal. Only 27 MHz of bandwidth is sent down the RG6 or RG6/U75 ohm cable, somewhere around 1 GHz. RG6 75 ohm cable has approximately 7 to 10 dB loss per 100 feet at 1 GHz (100 feet is a typical length from receiver to dish). Also, it has about 4 ohms DC resistance in 100 feet, so the 18 volt supply will have some voltage drop. The DC-DC converter will work fine over a few volts of range. The input signal is approximately -70 dBm at the LNB. 11.45 to 12.75 GHz in NA, Japan and Korea, 10.7 to 12.75 in Europe total cascaded gain is 55 to 60 dB with 1.0 dB noise figure. An image rejection filter is sometimes use to clean up the noise from the image band. Otherwise an image rejection mixer is used. The mixer and IF amp are almost always combined onto a single monolithic chip using MMIC technology. Often an RF amplifier stage or two is employed in front of the mixer to reduce the downconverter noise figure (which makes it an active mixer). Today's down-converter ICs are silicon, the only GaAs chips are the discrete low noise FETs. A low cost circuit board is used (not ceramic!) and include RF and non-RF components. All components are surface-mounted (no wire-bonds). The LNA consists of discrete 0.25 micron "super-low-noise" transistors in ceramic or plastic micro-X packages, from Japan (NEC, for example). The first stage is more expensive than second stage, screened for lowest NF, with a minimum noise figure (Fmin) of 0.45 dB at 12 GHz. The second stage needs to only provide 0.8 dB (Fmin) for a successful DBS LNB. 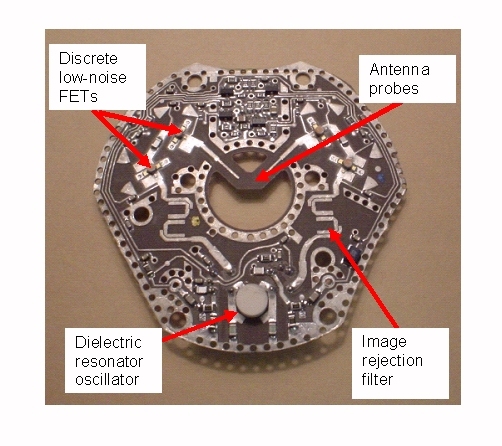 The combined noise figure of the two stage LNA of the LNB, including matching networks, bias networks and blocking caps needs to be under 1.0 dB. So, you ask, why did they go to the trouble of designing LNAs using discrete FETs rather than MMICs? There are two reasons., Grasshopper... cost, and noise figure. Try to find a 12 GHz LNA MMIC that costs less than a dollar and has less than 1 dB noise figure. Or just try to find a MMIC LNA with <1 dB noise figure! Tip: when you are designing a two or three stage LNA using discrete FETs, always return to a known impedance (such a 50 ohms) between stages. Don't try any fancy interstage matching like you might on a MMIC, you will regret it. Most of the matching is accomplished using low impedance series lines, which act almost like quarter-wave transformers. The blocking cap between stages should be a 30 x 60 mil surface mount 1.0 pF cap. The idea is that the series resonance of the cap occurs exactly at the DBS band, so it behaves like an RF short. Of course, it should have nearly zero parasitic real resistance. You can verify that you have a good capacitor by measuring it's S-parameters across a gap in a fifty-ohm test fixture. You don't need a blocking cap on the input, the antenna presents a DC open. In the example, only one cap is needed for each two-stage LNA, it is located between the two FETs. At the input, the LNA sees an open circuit looking at the antenna, and it sees an open circuit at its output looking into a band-pass filter. Total budget for this capacitor should be less than $0.10. Update May 2016... contest is now over, below we point out the stability resistors and many other features. Update May 2016: we had three people send in answers to where the stability resistors are, and will send each of them the gift we promised, because we are so kind an generous and all that. Here is a brief description of what is going on in that LNB, read it and you can add LNB design to your resume! U1 is a bias controller, and sets the current in each amplifier FET to 10 mA. VGS is generally between -0.1 and -0.4 volts. The bias controller generates its own negative voltage from +6V. RL1A and RL1B are in series with the gates of Q1A and Q1B, help low frequency stability. Because they are bypassed by capacitors before they see RF, they do nothing in the band. No resistive elements can be placed directly in front of an LNA without corrupting the noise figure. RL2A, RL2B, RL3A, RL3B, RL4A, and RL4B probably help stability in the band as well as outside of it. 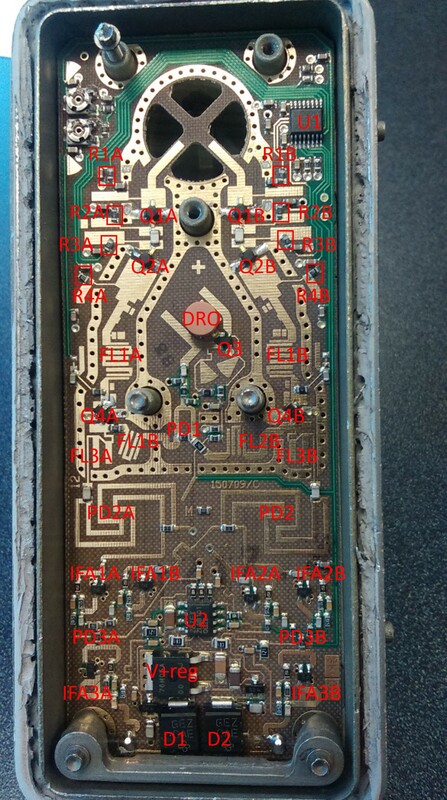 Note that they are bypassed with capacitors on the side opposite the RF stubs. DRO provides LO signal, using a discrete FET oscillator Q3. PD1 splits the LO signal. It is a Wilkinson. FL1A and FL2B are image rejection filters (bandpass). FL2A and FL2B block RF from leaving mixer LO ports (bandpass). FL3A and FL3B block LO and RF from leaving mixer IF ports (low-pass). PD2A and PD2B split the IF signals. IFA1A, IFA1B, IFA2A and IFA2B are IF amplifiers. PD3A and PD3B combine four IF signals into RHCP and LHCP signals. These are resistive splitters. IFA3A and IFA3B boost the RHCP and LHCP IF signals. Vreg+ is a linear voltage regulator across +18V input (and make the most heat). Its output is +6V. D1 and D2 are transient protection diodes that shunt the coaxial inputs.